On May 13, 2005, in the Uzbek city of Andijan, an armed confrontation took place between Islamic militants and troops from the Ministry of Internal Affairs. In the course of the ensuing melee close to 200 persons from both sides were killed. There is no doubt that the militants initiated the confrontation by attacking local government offices and a maximum security prison, and that the appalling number of deaths was due to deliberate actions and poor judgment exercised by both sides. However, specific details on the day’s events were lacking at the time and, on some points, remain unclear and in dispute down to the present day. These grim events occurred at a delicate moment in the relationship between Uzbekistan and the United States. After the terrorist attacks on the World Trade Center in New York and the U.S. Department of Defense, the Government of Uzbekistan had offered logistical and basing support to NATO’s Operation Enduring Freedom in Afghanistan. Thanks to this, the Pentagon stationed U.S. Army, Air Force, and Marine Corps forces at the Karshi-Khanabad airport in southern Uzbekistan, whence they conducted operations in nearby Afghanistan. Many Americans supported this arrangement as an appropriate form of cooperation among friends. Others, including activists from various non-governmental organizations, criticized it as inappropriate collusion with a government they considered repressive and hostile to the human and civic rights of its citizens. A similar polarization of opinion occurred in Europe. This situation all but guaranteed that every piece of information emanating from Andijan would become the object of fierce contention in America and Europe. Three further factors caused the volume of these ensuing debates to rise still higher, and their tone to grow ever more bitter. First, caught off guard and not experienced with dealing with the international media, the Uzbek government was overly reluctant to release information that might have clarified points of contention. On many key issues it was itself doubtless seeking evidence and clarification, and was not in a position to provide the instant reporting that reporters sought. Second, the government’s reluctance to wade into the mounting controversy over Andijan was due in part to a confrontation with the western organization Human Rights Watch that had occurred only eleven months earlier. In May 2004, a jailed murder suspect named Andrei Shelkovenko died while in police custody in Tashkent. Human Rights Watch promptly announced that his death had been caused by torture. However, the Uzbek Ministry of Internal Affairs accepted a suggestion by Freedom House for an independent investigation, consisting of American and Canadian experts. By the end of May the commission concluded that the death was a result of suicide and that there was no evidence of torture. To its credit, Human Rights Watch prominently issued a press release acknowledging its error, but by this time the damage was done. Few, if any, western media took note of Human Rights Watch’s mea culpa, nor did western governments. This episode goes far towards explaining the Uzbek government’s cautious and defensive response to requests for information and its opposition to requests for site visits to Andijan and for the establishment of another international commission. In the end that reluctance proved counterproductive, but it is to some degree understandable. A third factor contributing to the volume and bitterness of the debates that followed the events of May 13 was the evolution of the media itself at the time. On that date no major American newspaper or TV channel had a reporter any nearer to Tashkent than Moscow. Of those reporters for major outlets who filed stories on Andijan, none knew the Uzbek language and all were heavily dependent on reports from civil society organizations. Some of these provided accurate and useful information. But with barely a handful of representatives in the region, weak command of local languages, and an institutional agenda to advance, many did not. Competitive pressure among such groups and between them and mainstream media assured that much baldly inaccurate information was disseminated and repeated. Ten years after that tragic day in May, 2005, the Government of Uzbekistan once again maintains correct and positive relations with both the United States and the European Union. While they disagree on some points, all three parties acknowledge that they share important strategic and economic interests and are eagerly advancing them in a low-keyed and constructive manner. Neither the Government of Uzbekistan, the United States’ State Department, nor the European Union’s Foreign Affairs Council chose to mark the decennial of the 2005 events. For perfectly understandable reasons they prefer to let the matter lie, to look forward rather than backwards, and to allow a process of healing to continue in their mutual relations. 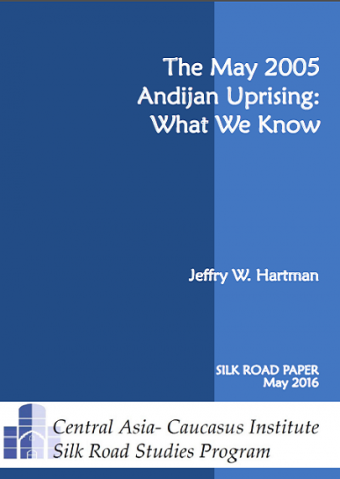 Why, then, issue two Silk Road Papers in 2016 on the subject of Andijan and its coverage in the West? The Central Asia-Caucasus Institute & Silk Road Studies Program Joint Center had no plans to commemorate the Andijan events until Jeffry Hartman, former U.S. Defense Attaché to Uzbekistan, submitted his study of the Andijan events for publication. The draft reflected both extensive research and careful analysis. After vetting it with colleagues, we decided to accept it for publication. But in our view the Hartman study stopped short, because it did not follow the complex story of how the American and international press treated the May 13 events. We therefore engaged Dr. John Daly to prepare a companion paper on the evolving coverage of Andijan. Because the authors and editors of this report respect the wish of Tashkent, Washington and Brussels to look forward rather than backwards, we have waited a full year beyond the decennial to issue these two papers. We do not assume that either of these reports will be the last on the subject, or that they should be. New information will continue to surface and new perspectives will continue to arise over time. The authors and editors of these papers welcome them both. Their sole hope, and admonition, is that those bringing them forward will do so in the constructive spirit in which the present papers were undertaken.